Happy October to you all but first, here's a little flashback to September! After a pretty 'meh' month of outfits for August, I'm glad that I found my inspiration again for September. Some of these outfits are my favorites out of the entire year so far! I really took a liking to rich, jewel toned colors of teal, hunter green, mustard yellow, and deep wine. Not sure if the gradually cooling weather brought out these darker toned hues, but I enjoyed the color palate. I feel as though I really played up my femininity this month, as well, with lots of circle skirts to accentuate my hips and girly details like lace, hearts, dots, bows, and floral. Can you also tell my love for hats is back?! Holy berets. My camel colored one got a lot of love for September. I think a big part of what makes me like these outfits more is the layering, even if it was simply just throwing a cardigan over a dress. Don't know how you warm weather ladies still manage to look wonderful and fresh always donning fewer pieces--I feel like I get/look so repetitive. There was definitely a 'pose of the month' for September too, haha. My classic one leg behind the other with the knee bent. I think I need to try something new, no? Come on, get out of your comfort zone, Lauren! Favorite Outfit: Wear Your ♥ On Your Sweater. Least Favorite Outfit: Autumnal Palette. For October I simply hope to keep developing outfits I like and enjoy wearing. I also want to continue working on getting more comfortable in casual dressing! I really liked your september outfits. 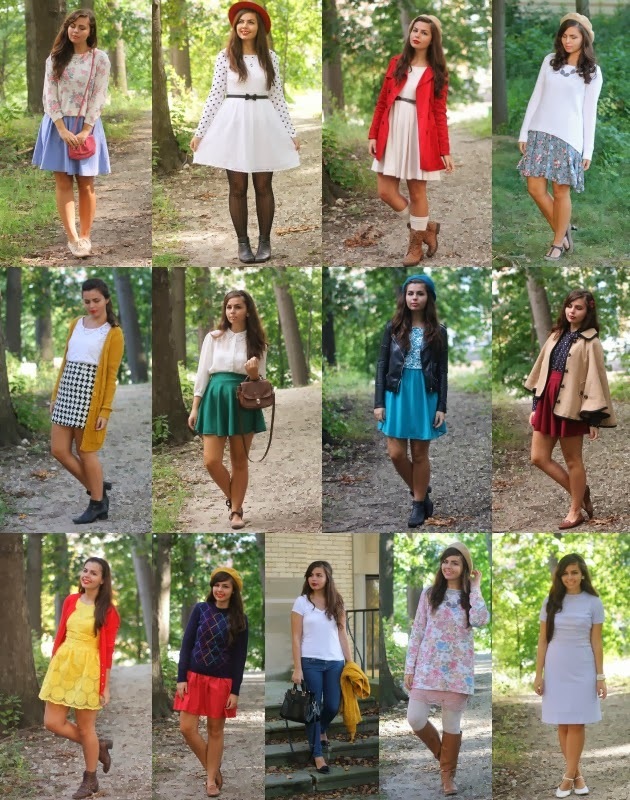 You wore SO many inspirational outfits in September! I love all of these feminine looks!